Foolish Waffles serves up their crowd-favorite pork belly bahn mi waffle. 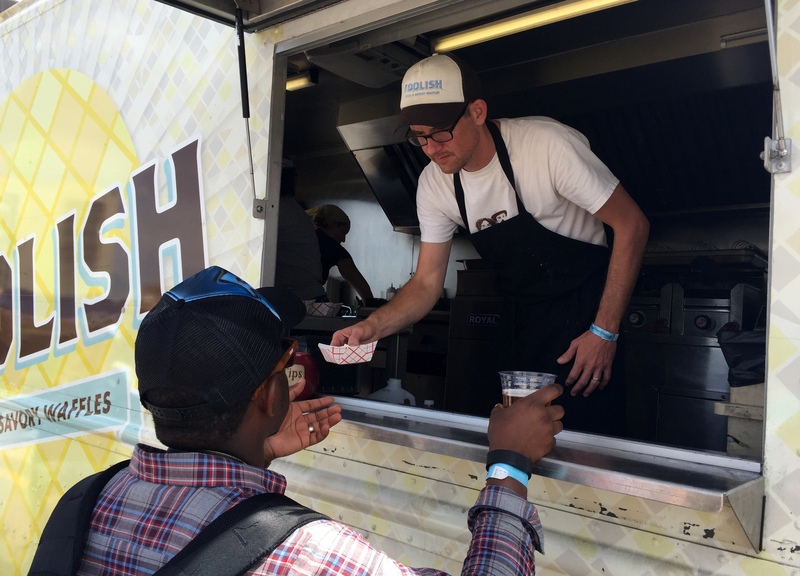 On Saturday, June 13, a dozen food trucks parked on JFK Bridge for the 5th Annual Vendy Awards, the city’s yearly celebration of the best in mobile eateries. Not known for being the best spot for a food festival, the bridge turned out to offer everything needed on the warm, sunny day: a wonderful breeze coming off the Schuylkill, plenty of tree-shaded grassy areas to sit and relax, and an open area to spread out the trucks so nothing ever felt claustrophobic. Evenly spaced along the avenue were two Sly Fox tents, one offering a selection of draft beers and another offering cans. The beers ran the gamut of what you would want on a summer day in the sun, from the Dad Vail Pale Ale to their SRT Ale, as well as classics like the Pikeland PIls and a Helles Lager. And while the beer was plentiful, refreshing, and tasty, the real stars of the event were, of course, the food trucks. For the first time in the five year history of the event, a single truck won both the People’s Choice award as well as the coveted Vendy Cup. Foolish Waffles took both on the strength of their pork belly bahn mi waffle, a delicious take on the Vietnamese sandwich that had everything you would expect, but set atop a fluffy waffle—definitely worth tracking the truck down for a full-sized serving. Best Dessert honors went to Undrgrnd Donuts, most likely for their Homer (which is dipped in vanilla and drizzled with raw sugar and chocolate bacon), but their French toast donut was awesome as well. Finally, Rookie of the Year was awarded to SeoulFull Philly, with their cheesesteak Korean—Korean BBQ marinated beef topped with kimchi, wiz, and onions. The selection from Philly Fry. Clockwise from top: loaded potato, surf n turf, steak, buffalo blue cheese. There were two other notable trucks, but not for the same reasons. Philly Fry was a standout, not only for their toppings but for their excellent French fries (although their toppings were excellent, too—especially the buffalo blue cheese fries). With the number of toppings available, and the ability to get fries in either regular, curly, or waffle, this is a truck to be on the lookout for. The Butter Food Truck, on the other hand, was a complete waste of time. They were offering Japanese curry chips, with the chips being hand-cut potatoes that were too thick and ended up undercooked. After not being cooked enough, they were drowned in cold curry sauce and topped with what must have been a half cup of sour cream. Combined with the fact that the line was completely stalled for 15 minutes with no explanation from the truck worker other than him playing patty cake with bystanders, and the experience with Butter was the worst of the day, and one of the worst food truck experiences we’ve ever had, period. At the end of the day, though, the event was as close to perfect as you can get on such a hot day. The breeze, the great food, the unlimited cold beer, and shady spots to rest really made the Vendys an event worth coming out to and hanging out at. Hopefully they can take over the same spot on the bridge next year, because they’ll be hard-pressed to find anything much better. And so would you, so be sure to get your tickets next year. The Homer from Undrgrnd Donuts. Foolish Waffles puts the finishing touches on their bahn mi waffle. 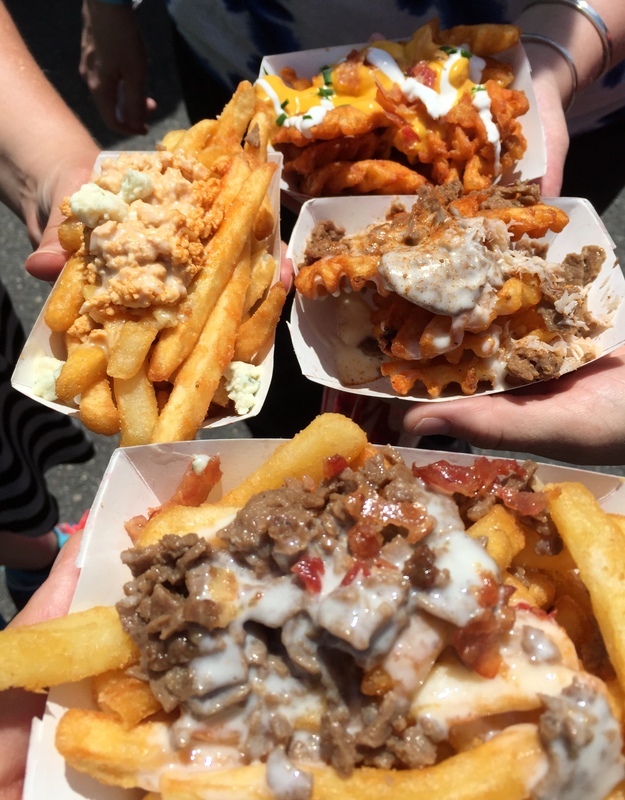 This entry was posted on June 16, 2015 by Ryan in Events and tagged food trucks, foolish waffles, philly, sly fox, vendy awards, vendy cup.